The convenience and excitement of gambling online has been the driving force behind the phenomenal growth of the online gambling industry. But as more people turn to online poker, roulette, blackjack, sportsbooks and other casino games, cyber criminals are becoming more sophisticated in finding ways to defraud legitimate players and the gambling sites they play on. As a result, gambling sites are forced to deal with a wide spectrum of Internet crimes and other in-game abuses that cost the industry hundreds of millions of dollars in fraud losses each year. 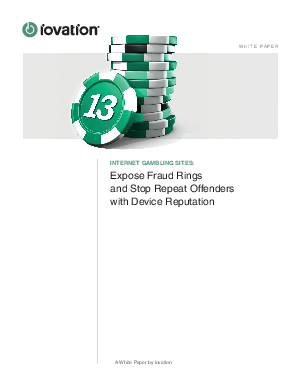 Despite efforts to thwart criminal activities such as fraudulent deposits, chargebacks, cheating, collusion and money laundering, today's sophisticated fraud rings pose a greater threat to online gambling providers than ever before.